AMI, Bristol, 1st May 2018 — A new report from industry consultants, AMI Consulting published in April 2018, is an authoritative comprehensive deep-dive analysis of the global High Barrier Rigid Plastic Packaging. Growing consumer demand for convenience as well as suppliers’ search for market differentiation are the main drivers for packaging innovation in the ambient long-life segment. High barrier plastic packaging offers superior functionality and aesthetics versus traditional packaging media (metal, glass). High barrier plastics have the potential to re-vitalise mature markets such as ambient soup, canned fruit, vegetables and fish, by introducing convenient, added value containers suited to modern day living. While there is significant opportunity for plastics to replace traditional packaging (metal and glass), the development of new applications, such as single serve capsules, provides another growth avenue. Single serve capsules have become the key contributor to growth of high barrier solutions. The application tripled in volume since 2013. Further growth in capsules is expected, but it will be tempered by competing non-barrier formats servicing the low-priced compatibles sub-segment. Single serve capsules are fueling not only demand for barrier thermoforming, but also enabling barrier co-injection projects, barrier IML and coatings to develop. The volume realised with barrier co-injection technology accounted for a marginal share of the market so far. The years 2016/2017 witnessed the second wave of interest in this technology, with much more promising results. The renewed interest is driven by the developments in single serve capsules, resulting in projects like Jabil’s K-cups for Keurig, Menshen’s barrier capsules compatible with Nespresso and Nescafe Dolce Gusto systems and Lapp Tec’s barrier capsule compatible with Nespresso. 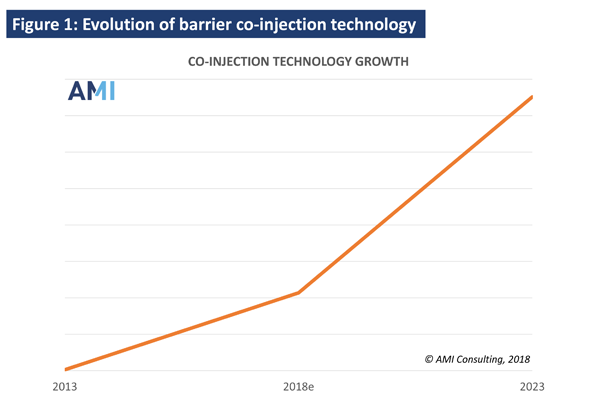 It is expected that co-injection technology will gain meaningful market presence in the next five years. Outside of capsules, co-injection technology is expected to increase its penetration via Milacron’s KlearCan concept commercialisation (following DelMonte’s breakthrough in the Philippines) as well in extended shelf life chilled dairy segment. Tel: +44 (0)117 314 8138.